The above figure is supposed to be a yeast cell, and as that it functioned in the film as a guide in the physiological processes that occurs when the human body is to burn off alcohol. - Figure Drawing: © 1959 by Harry Rasmussen. In 1959, I, Harry Rasmussen, worked among other things, on a cartoon segment in a short film which was about how alcohol affects the human organism. 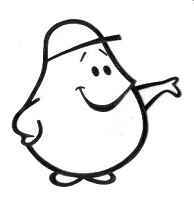 I even stood for the organization, design, layout and animation, and for this purpose I designed, inter alia, the above little guy who was supposed to be a yeast cell. It was this that was the 'guide' in the cartoon section. Shortly after, I also got the task of making an advertising cartoons on "Danish Ham" for DAK, which I won in all respects. When the film was about ham, it was an obvious idea to let a pig, in this case a little pig, be the protagonist. At that time in the summer of 1959, when the storyboard for the movie was pinned up on the storyboard in front of my drawing board, also beside tables of story drawings for "Ping Pong" was the studio a day in July, having an extremely celebrity guest. It was none other than Walt Disney himself as his big fan, me, it gave a unique opportunity to meet and talk with, albeit very briefly. The name Disney had kind of 'haunted' me - as well as several of my colleagues - ever since childhood when we every Christmas had seen "Metropol's Christmas Show", and the oldest of us in 1938 it for us completely unforgettable "Snow White and the Seven Dwarfs ". The reason for Disney's visit to Nordisk Film was linked to the fact that it was this old and venerable film company that had exclusive right to charge the Danish versions of Disney's long cartoons. At the present time, "Tornerose" (1959, "The Sleeping Beauty") not yet had Copenhagen Premiere, which only occurred in Tre Falke Bio marts 29, 1960. And you knew that Nordisk Film in the spring of 1961 slowly began working on the preparations for the dubbing of Disney's newest long animated feature "101 Dalmatians" (1961, Danish title “Hund og Hund imellem”). On that occasion Ib Steinaa and I, who were present in the second errand, met with Sønderhousen, Lichtenberg and actor Ove Sprogøe in one of the theaters out of Nordisk Film Technique. Steinaa and I were invited to see some sections of the film, in which especially the owl Archimedes occurs. Sprogøe should namely speak the owl's Danish voice. As a rule, always when dubbings of a foreign film, the actors voices are recorded individually, often even if two or more characters were talking together in the film. Since the mixing editor had to make different dialogue bands, so it sounds like the actors speak directly to and with each other. It was also amusing to see the sequence in which the owl was laughing quite uncontrollably over the wizard Merlin’s vision for the future. But it was on this occasion that Jørgen Sønderhousen aired its strong aversion to Disney and his films. This happened with irascible words like: "Disney and his films - it is pure poison!". We others were not, however, agreeing with him in this, but some younger people belonging to the political left wing even then uttered a hatred of virtually everything that was American. It was further reflected in and with the youth rebellion in 1968, which was to dominate the next decade, both politically and culturally). On tour around the Nordic Cartoon Films were Ib and Kirsten Steinaa ardent and awed guides. A completely relaxed and unpretentious Disney was also accompanied by the Director of the Gloria Film, Jørgen Jørgensen, who represented and handled Disney’s Danish interests, and Director of Nordisk Film Junior, Ove Sevel. Disney was curious and obviously interested in what was going on and was made in the studio. At the time when Disney and his companions had come into the relatively small space where I, Harry Rasmussen, Anton Fredsøe and Antti Peränne had our usual working place, Disney let drop some comments about that in his time he had started during very modest circumstances. He elaborated not his nostalgic thoughts, but, however, was quite interested in the storyboards that hung on the wall and asked me, Harry Rasmussen, out of what it was for movies and what they were about. 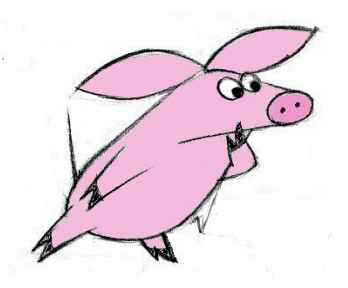 When he saw the drawings of the small, in itself quite simple and insignificant pig, as I was just about to animate, he said kindly, "Funny little fellow!" 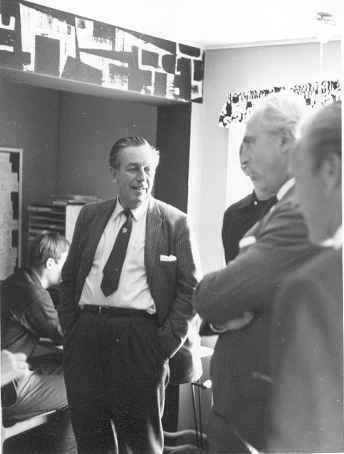 A great day: Walt Disney’s visit to the A / S Nordic Cartoon Films on Mosedalvej in Valby 6th of July 1959. Here is Disney with follow in the studio, where Anton Fredsøe, Antti Peränne and I, Harry Rasmussen, sat and worked. 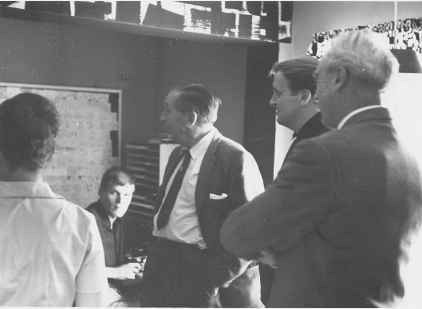 It is of course Disney in the center of the image, to the left of Walt Disney in the middle, seen Anton Fredsøe sitting at his drawing desk, while the hand in the lower left belongs to me, Harry Rasmussen, who were engaged in conversation with Disney. To the right is the director of the Metropol Theatre and Mickey Mouse Corporation of Denmark, Jørgen Jørgensen, and the Director of Nordisk Film Junior, Ove Sevel. Behind Jørgen Jørgensen discerned Ib Steinaa (in dark shirt). - Photo: © 1959 by Paul Dupont and Dansk Tegnefilm Historie / Harry Rasmussen..
Disney would also like to know something about what "Ping Pong" was about, but at that time managed Sevel kindly but firmly to get him escorted out of the studio and further around the studio. Steinaa told afterwards that Sevel would have wanted to avoid that Disney would be 'inspired' by particular "Ping Pong". Because it was well known he said, that that Disney was always looking for new ideas and new material for cartoons. At the time he was for the rest also interested in ideas for its planned theme park, Disneyland. To this end, he visited the Copenhagen amusement park TIVOLI, of which he reportedly was very impressed and excited. Exactly the same situation as in the above photograph: To the left of Walt Disney is seen in the foreground (and with back to) Kirsten Steinaa and (seated) Anton Fredsøe. To the right of Disney shows Ib Steinaa and Jørgen Jørgensen. As the picture shows, Disney is clearly interested in the storyboard on the wall in the background on the left. It is the story drawings for the planned long cartoon "Ping Pong", which is pinnet on the board. - Photo: © 1959 by Poul Dupont and Dansk Tegnefilm Historie / Harry Rasmussen. 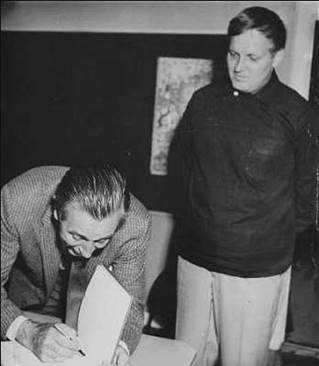 Two historic photos: At the end of his visit to A / S Nordic Cartoon Films July 6th 1959 is here seen Walt Disney on the photo to the left as he is in the process of writing his signature in the company's guestbook. 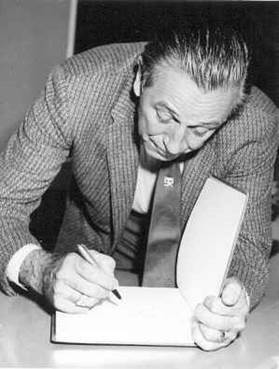 In the photo to the right shows a clearly proud and confused Ib Steinaa as he attends Disney writing in the guestbook. - Photos: © 1959 by Poul Dupont and Dansk Tegnefilm Historie / Harry Rasmussen. Above is the little pig, internally called "Piggy" which was the main character in an advertising cartoons for "Danish Ham" (1959). It was this character, about whom Walt Disney during a visit to A / S Nordic Cartoons said: "Funny little fellow!" - It was intended to let "Piggy" be starring in a series of TV cartoons, but the plan was abandoned. - The figure "Piggy" was designed by Harry Rasmussen. - Drawing: © 1959 by Harry Rasmussen. Furthermore, the work on "Piggy", a name which we for fun had given the little pig, gave plenty to do first and foremost for me. There was, as usual, drawing a storyboard for the film, in this case of mine who also did work cards, on which Ole Mortensen composed the music. Then I made a story-real, to make sure that the music and sound matched each other. Only now was Steinaa switched on in his capacity as supervisor, and he had at first no objection, so I could go ahead and sign layouts for the few backgrounds that were in the movie. Then I started with the animation, of which I both made the key-poses and the in-between drawings. After the line tests for various scenes were made and approved by myself, went the animation drawings for inking and coloring, and then on to the shooting on the trick camera, which I in this case even stood for. The above article is a slightly revised excerpt from “The History of Danish Animated Cartoons”, section DANSK TEGNEFILM 1950-1970 Del 2 – which unfortunately is not yet translated into English. But one can hopefully enjoy the pictures.